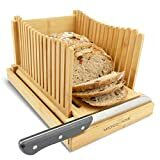 Save on Bread Machine Parts & Accessories at UCBC Group. Top brands include MAGIGO, & FLAPRV. Hurry! Limited time offers. Offers valid only while supplies last. 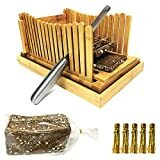 Bread Slicers for Homemade Bread with Crumb Catcher Tray, Compact Foldable Bamboo Bread Cutter Guide, 100 Bread Bags & 100 Twist Ties, Thickness Adjustable, Thick & Thin Slices 1/3", 3/8" and 1/2"